Looking for some biking inspiration this season? Meet Alex Lee and Nicki Lindgren. For the past two years they have been delivering delicious, handmade meals around the Twin Cities by bicycle. Alex and Nicki volunteer at Open Arms of Minnesota, a nonprofit organization that cooks and delivers free, nutritious meals to people living with life-threatening illnesses in the Twin Cities. Open Arms relies on volunteers to work in the kitchen, plant in the garden, and deliver meals to clients. Their routes take them all over Minneapolis. On any given day, Alex and Nicki deliver meals to around 5-6 houses. If they don’t dawdle, the route usually takes them about one to two hours. However, they like to stop and talk to people and explore new places in the Twin Cities. It gives them a chance to interact with people in the community. Both Alex and Nicki began cycling because their vision is impaired. While they often walk, bus, or take cabs, biking is their most frequent form of transportation. When people see them arriving by bicycle with the food, it makes them happy. Clients look forward to having their meals delivered on a bike. “I like the fact that people look at us with awe. A lot of the clients get really excited!” Nicki said. Biking sometimes makes deliveries easier. Sometimes volunteers have difficulties delivering meals because they can’t find parking. With a bike, you don’t have that problem. “You just park right in front, and you don’t have to carry anything anywhere,” Alex said. They often take routes that can be difficult for drivers. They want to make sure the clients will get their food. 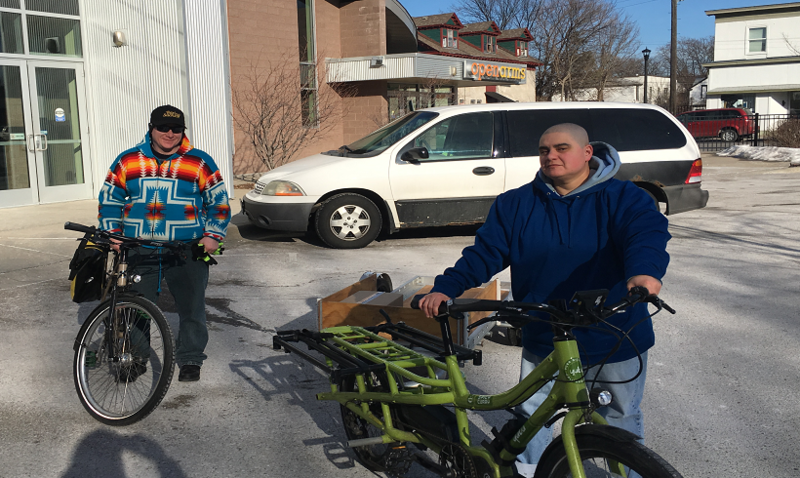 Making deliveries by bicycle may not be the norm at Open Arms, but Nicki and Alex look forward to it each week. Interested in volunteering with Open Arms? Visit www.openarmsmn.org/volunteer/ or contact Lila Gilbert at lila@openarmsmn.org.